Well that’s the thrilling new experience awaiting the visiting public and space enthusiasts alike starting this summer at the Kennedy Space Center Visitor Complex (KSCVC) in Florida – after the ghostlike Space Shuttle Atlantis (see photo album above & below) is unveiled from a thick coating of shrink wrapped plastic. But – there is one important caveat regarding the holodeck dream sequence. Starting on June 29 you will be seeing the ‘real deal’, an actual space flown NASA Space Shuttle Orbiter – not a high tech imaginary glimpse, engineering reproduction or holodeck recreation. During the recent SpaceX CRS-2 launch events, I was very fortunate to take a behind the scenes inspection tour all around of the new ‘Space Shuttle Atlantis’ pavilion that’s been under construction at the Kennedy Visitor Complex for a year and is now racing towards completion. And Atlantis is still supremely impressive beneath that white plastic wrap – unlike any shuttle view I’ve see over the years. Scan through my photo album walking around Atlantis – covered in 16,000 square feet of shrink wrap plastic – and the Star Fleet like pavilion that truly reminded me of an exciting Star Trek adventure ; to see what’s in store soon. The orange exterior pavilion facade is meant to evoke the scorching heat of reentry into the Earth’s atmosphere. 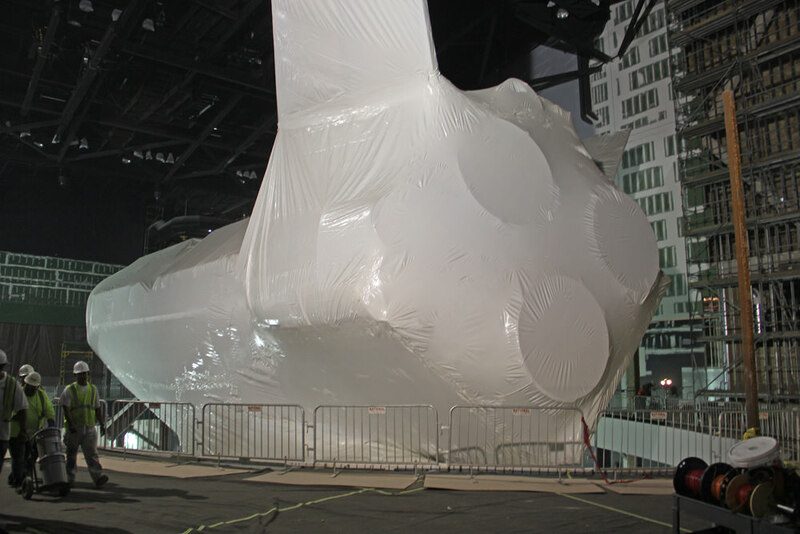 The plastic wrap is protecting the orbiter from construction debris and will be unfurled in May. Then the payload bay doors will be carefully opened and the Canadian built remote manipulator system (RMS) — or robotic arm — will be installed and extended. Inside her new 90,000-square-foot home, everyone will be treated to breathtaking, up close views of the real ‘Space Shuttle Atlantis’ mounted high on steel pedestals – tilted at exactly 43.21 degrees – simulating the outlook as though she was ‘in flight’ orbiting Earth and approaching the International Space Station (ISS). The ISS and Hubble are the primary legacies of the Space Shuttle program. Atlantis flew 33 total space missions, spent 307 days in orbit and conducted the final flight of the shuttle era. You’ll gaze from stem to stern and from above and below – and all while peering down into the humongous open cargo bay, up to the heat shield tiles, or across to the engines, wings, tail and crew flight deck. Walkways will provide exquisite up close viewing access. Atlantis rises some 30 feet off the ground. Although her nose soars 26.5 feet above ground the portside wingtip sits only 7.5 feet from the floor. The wing tip top soars 87 feet from the ground. And sitting right beside Atlantis will be a co-orbiting, high fidelity full scale replica of NASA’s Hubble Space Telescope which was deployed and upgraded by the astronaut crews of six space shuttle missions. ISS module mockups, simulators and displays will tell the story of the massive stations intricate assembly by several dozen shuttle crews. More than 60 exhibits, hands- on activities and artifacts surrounding Atlantis will tell the complete story of the three-decade long Space Shuttle program and the thousands of shuttle workers who prepared all five orbiters for a total of 135 space missions spanning from 1981 to 2011. Atlantis has been lovingly preserved exactly as she returned upon touchdown at the shuttle landing strip at the conclusion of her last space mission, STS-135, in July 2011 – dings, dents, scorch marks, you name it. And that is exactly as it should be in my opinion too. Shuttle Atlantis was towed to the Visitor Complex in November. The orbiter is housed inside a spanking new six- story museum facility constructed at a cost of $100 million that dominates the skyline at the largely revamped Kennedy Space Center Visitor Complex. Standing tall right outside the entry to the museum pavilion, visitors will see full scale replicas of the twin solid rocket boosters mated to the orange external fuel tank, suspended 24 feet above ground – and reaching to a top height of 185 feet. They will be erected vertically, precisely as they were at the Shuttle Launch Pads 39 A and 39 B. It will give a realistic sense of what it looked like atop the actual shuttle launch complex. The mighty steel framework for holding the boosters in place (in case of hurricane force winds up to 140 MPH) was coming together piece by piece as workers maneuvered heavy duty cranes before my eyes during my pavilion museum tour just days ago. Well, get set to zoom to space as never before beginning on June 29 with the last shuttle orbiter that ever flew in space. That’s gotta be the biggest plastic bag i’ve ever seen! We have been waiting for this. We will be there to see it this summer. Thank you for the article! And how much will it cost a family of four to see this vehicle that we paid for with our tax money? This is turning out MUCH better than I thought it would. I’ll definitely be checking it out.